DIY Network’s The Vanilla Ice Project! Wirk’s Holiday Home Invasion 2017! Welcome to East Coast Metal Structures!Serving the Southeast, Nationally and Internationally for over 30 years. Here at East Coast Metal Structures we specialize in the fabrication and erection of Bar Joist, Structural Steel, Metal Decking, Railings, Stairs, Louvers and Miscellaneous Metals. With an Employee base of over 100 men in the field, we feel comfortable saying we can man any job. All of our foremen have at least 15 years’ experience, welders are certified, CPR certified and 10 or 30 hour OSHA certified. Our goal is to serve the Construction Industry for all their steel needs throughout the Southeastern United States and the Caribbean. We strive to provide all of our clients with exceptional, personalized service and look forward to serving past and future clients for many years to come. I wanted to drop you (Daymon) a note, thanking you and the rest of the East Coast Metal Structures team for the continued job well done on the Value Store It - SW 8th project. Your team has stepped up to aid with keeping our tight / rigorous project schedule and looking to top out the project in July. From shop drawings through the structural steel erection your team has handled every challenge / task with a positive team oriented attitude, making the most agonizing issues minute, which has been the case since you and I started working together three years ago. 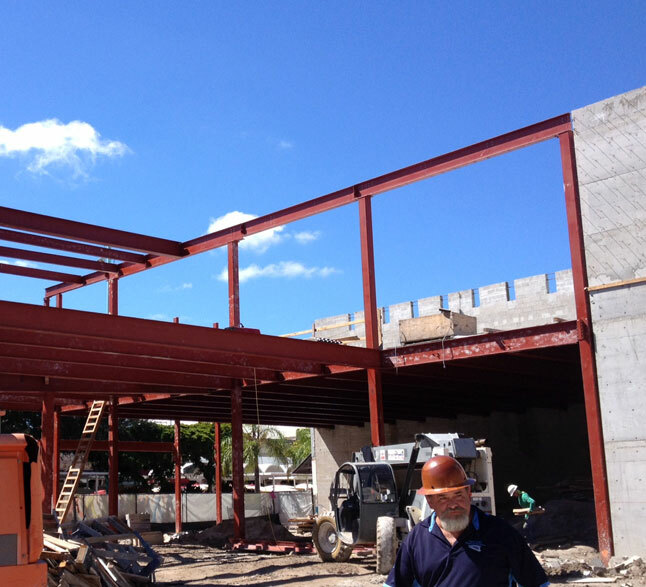 I would definitely recommend East Coast Metal Structures as a qualified and well organized structural steel erection firm with the capabilities to complete a plethora of projects ranging in all sizes.